We are located in the Carol Stream/Wheaton area. We are located on the southwest corner of the intersection of Gary Avenue and Geneva Rd. We are about a mile south of North Ave. This whole week we encourage you to bring your friends to any of our classes. 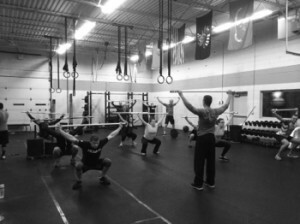 They will all be suitable for the brand new person looking to try CrossFit. They can register for any of our classes this week here. It’s free as long as they attend with a member! Join the team today! Scale the T2B and weights as needed. Copyright © 2011 CrossFit, Inc. All Rights Reserved.